Hey guys! In the absence of anything new to post on our fansite, I’ve decided to make screen captures of some old videos. Our gallery has had a “Screen Captures” category since we relaunched it years ago, but none of us had had anytime to work on it until now. 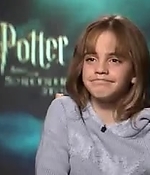 I’m thinking of going year by year, so I started with videos from 2001, when Emma was promoting “Harry Potter and The Philosopher’s Stone” with Daniel Radcliffe and Rupert Grint.